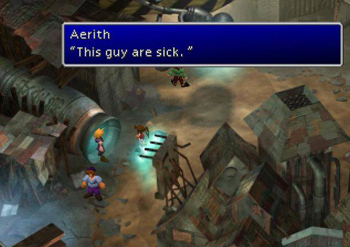 Square Enix launches the Final Fantasy VII PC re-release then pulls it immediately. According to the Square Enix forums, a few quick-fingered fans managed to nab digital copies of the forthcoming Final Fantasy VII re-release last night, when it was accidentally listed for sale on the game's website. Unfortunately, the fans paid $12.70 for a game that doesn't work, as the title's SecuROM DRM won't accept any serial numbers or let them activate the product online. Square Enix pulled the game shortly after its release, which hasn't stopped a small, but vocal, minority from claiming the title's "draconian" DRM is driving them into the always open arms of piracy. The company hasn't commented on the situation as of yet, which has left one customer particularly disgruntled. "If I do not see any official statement tomorrow," writes one forum user. " I will report the issue to the BBB and I encourage others who purchased the game to do the same. Because customer support's apologies do not make it any less illegal. You cannot take a customer's money, refuse to do a refund and not provide the goods' they paid for." The fact the game doesn't work hasn't stopped some gamers from rummaging through its files like hungry raccoons. According to reports, the game uses the awful midi soundtrack from the wonky 1998 PC port instead of the version included in the original PSX release. Fortunately, all the files are in the Ogg Vorbis format, meaning it shouldn't be difficult to replace them with tracks from the PSX release, or perhaps some of the swankier orchestral arrangements from one of the many FF7 soundtracks Square Enix has released over the years.